I had some paper collapsing fun the other day at work. This John McKeever design was something I'd tried maybe a year ago with limited success. This time around I finally got it right. It really is an insanely difficult crease/collapse pattern. I found it so vexing to transfer to the page that I decided to just print the pattern and then cut out the square from there. Once I did that, it was actually quite enjoyable to collapse. In that frustratingly hard origami kind of enjoyable way. To facilitate the collapse I did all the folds in both directions. So even though the design calls for specific valley and mountain folds, all of mine were genderless. This helped in getting the paper to cooperate. I just used regular printer paper. Nothing special. 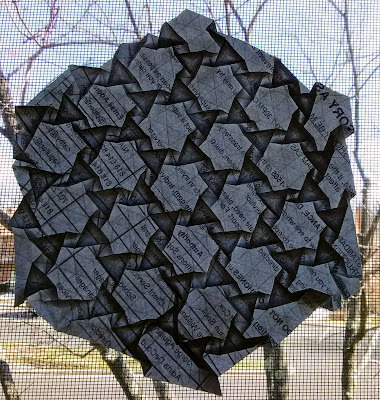 I find a lot of regular priced origami paper weakens too quickly on tessellations and intricate collapses. The pulpy nature of printer paper helps give it strength for repeated folding. I collapsed the middle according to the design, but the outer squares I just made sure I was getting squares without concern for which direction the corners were overlapping. I fixed that later after the middle was set and all the squares were fully collapsed and nicely creased. I really like the pattern that's created on the back as well. The crease pattern is from McKeever's flickr page. His name for the design is Fujimoto Style Escher Steps. I bought it looking for inspiration for creating new designs. But I liked this pattern so much that I went ahead and just folded it verbatim. It was a little bit tricky to collapse. The folds had to go in a lot of different directions simultaneously. I started out trying to first do a hexagon twist and then the triangle twists that radiate off of it. That didn't work out well. So I switched to collapsing a full ring to start. Meaning I arranged one hex and the six triangles around it all together until I was able to flatten that unit all at once. Then I radiated out from there in a circular fashion collapsing additional hexagon/triangle units one at a time. 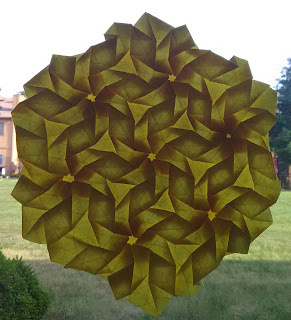 I saw this tessellation somewhere. I can't remember where now. But I liked it enough to figure out how to fold it. 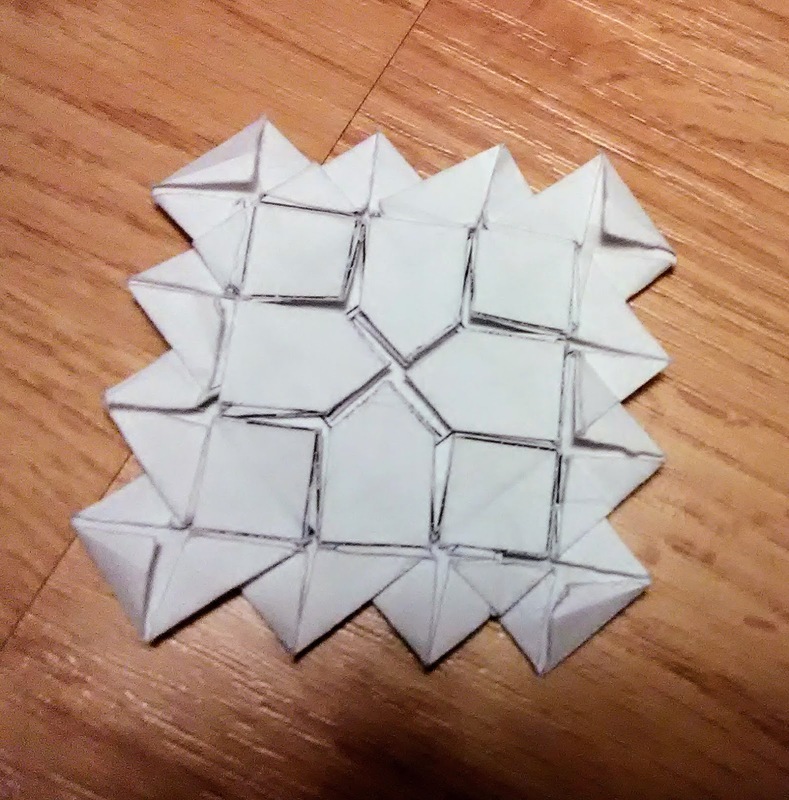 Little did I know when I started that it was a flagstone tessellation. I should've known, but I didn't find that out until I started puzzling out its construction.
. They can be a pain. And this one was. There was a lot of pre-folding. That was 90% of the work. After that, it was a matter of slowly coaxing all those pre-folds into their proper places. It was not an easy task. It was however, a very pleasing result. 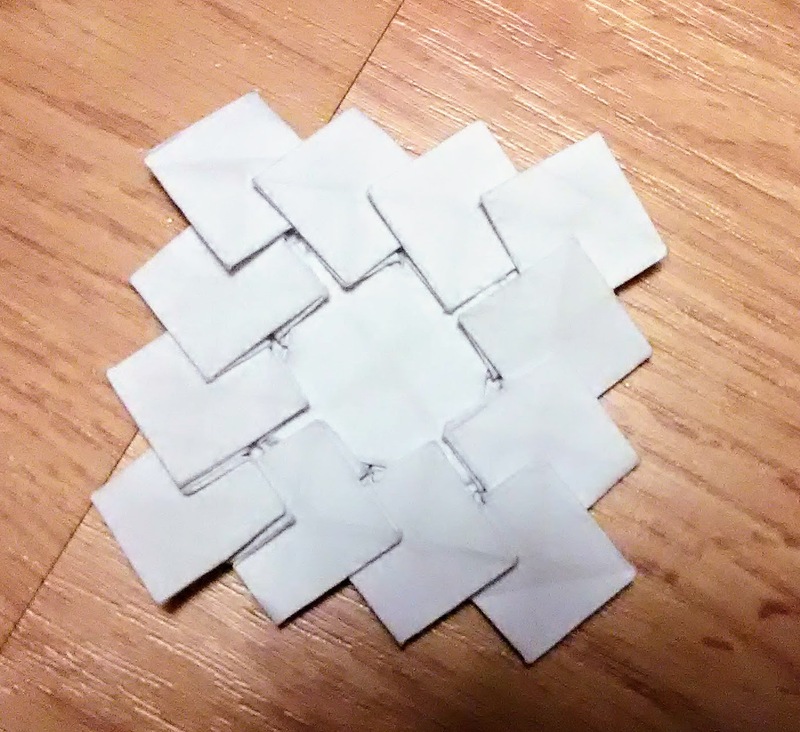 It's a series of hexagon twists on the back of the paper. Then you go to the other side and surround them with rhombuses. Some large triangles allow everything to lay neatly together. The star twist and its extended version have been thoroughly documented in print and on the Internet. 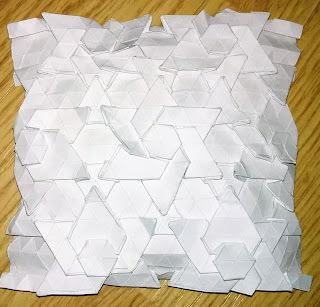 It's an easy design to fold that yields pretty impressive results. There are a whole lot of rabbit ear sink folds, which do make it a little tedious. But as far as concepts go, it's fairly simple to understand. It's a straightforward crease pattern to follow. The trickiest part is all those rabbit ears so close together. It won't flatten much until you've done a lot of them. So the paper can be a bit unwieldy for a good portion of the collapsing. But once you begin to get those creases into place they tend to remember themselves. I like to do the hex twists first. Flattening each and then unfolding. Then do most of the rabbit ears and really get those all in place. Unfold again. Now assemble starting with the central star and working outward using all those preformed creases to let the paper naturally fall into place.